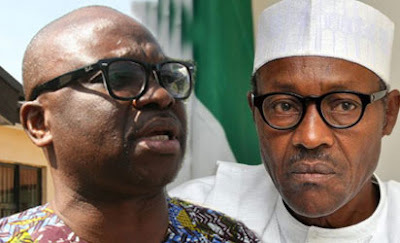 Ekiti state governor, Ayodele Fayose has fired at President Muhammadu Buhari over his claim that many of those who looted public treasuries in the government of former President, Goodluck Jonathan had started returning the stolen funds to the government. Fayose said President should rather stay at home to govern the country instead of junketing around the globe and acting like a saint before the international community. Special Assistant to the Governor on Public Communications and New Media, Lere Olayinka, said in a statement issued in Ado-Ekiti on Thursday that Governor Fayose advised President Buhari to tackle the collapsed economy of the country headlong instead of going from one country to another, casting aspersion on Nigerians with his sing-song of fighting corruption. “Buhari’s statement in Tehran, Iran that it was easier for him as a military Head of State in 1984 to arrest corrupt individuals and put them in protective custody was a pointer to the fact that he has not changed from the dictator that he was then.